I had such a fun time making this card set. I love working with old lace and velvet brads! The size is 3"x6". I double matted - so just take off a 1/2" to get your inside mat. The accordian flower is easy but trickey - you will need 2 hands. hee,hee. For the flower you will need a 3/4" x 12" double sided paper strip. Score every 1/2" all the way to the bottom of strip. Attach the ends and open it up like aflower ( thats the trickey part). Once you have it flat, like the flower, drop some glossy accents in the middle and hold (both hands)- put your brad in and let dry. 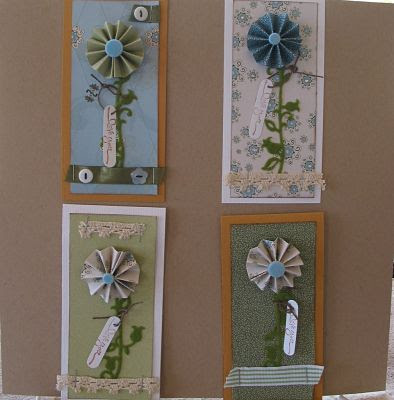 Once you get all your flowers done then you are good to go embellishing your cards. Have fun with it!!! Those are beautiful cards, and I love the flowers!